Because there's actually quite a few of us here now. Does anyone have experience with OpenStreetMap? What's the best editor for it? How hard is it to construct roads and roundabouts with just a GPS trace when the Bing satellite map is out of date? I prefer to use JOSM but there's a slight learning curve to it. The in-browser editors are pretty easy to just pick up and use. I know Potlatch made it easy to see any GPS traces in the editing area which had been uploaded to the site, and I suspect iD also has this capability. 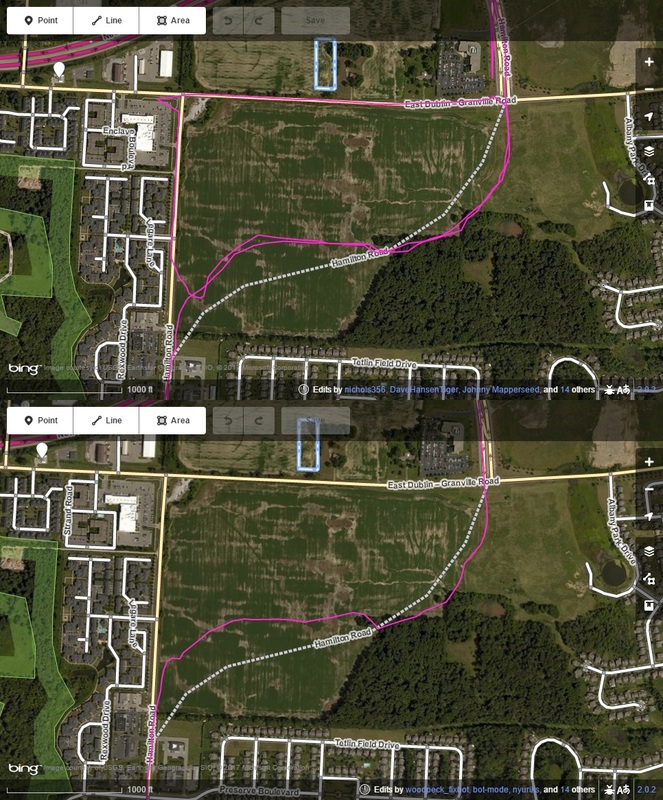 In JOSM you can do basically that, or simply load your local GPX file as a layer. Westerville thankfully seems to have dropped the ridiculous oversized initial thing from their street blades. Normally I chalk the oversized initial caps up to misreading of the MUTCD, but the fact that they did both oversized and normal caps on the same sign ("W Main St") made it seem like a deliberate thing, which was confusing. Compressed type was always a pet peeve of mine, especially since it's something that only really came along when computers came along and made it easy to manipulate fonts that way. Yeah, I always try to drive through the roundabout at least once in each direction, sometimes several times so I can sort of draw an average line. I also follow the philosophy of a roundabout being four closely-spaced, yield-controlled intersections, and that influences how I draw them on the map. Okay, I didn't see these before tonight because they didn't show up on my mobile device for some reason. Those are some pretty janky traces. I suggest checking the settings in whatever program records your trace. The sampling interval should be like 1s, with no minimum distance between recorded samples. Also, put your recording device (or the GPS antenna if external) up on the dashboard so it gets a clear view of the sky through the windshield. What's cool is I couldn't remember the URL so I did a Google Image Search for "two way left turn lane" and it's in the first few dozen results. Oh good, I'm not the only one with that pet peeve. Oh so this is where the sloppy traces come from! I never knew that. Not meaning to demean -- I was always wondering why someone wouldn't have done it better but if it's coming from a GPS trying to automate it it makes a lot more sense. I didn't know you used OSM, Glenn. I've touched it a few times, mainly as part of "map-a-thon" contests at my school. I finally got around to updating Java so JOSM works again*, and I just updated the Jeremiah Morrow Bridge to reflect southbound traffic on the new span. And then I corrected the location of a graveyard that had previously been shown in the middle of the freeway. You can't just...leave inoperable signal heads uncovered like that. Legally that would make this an all-way stop, I suppose. Though what's even funnier is the elaborate traffic signal setup for the dead-end. The "no turn on red" makes me laugh every time. What really bugs me about that part of Marion is if you're coming from 23 and miss the turn onto McMahan, you'd think you could get to Arby's from the Office Depot parking lot, but no. There's a place where those lots connect to the McMahan backage road, but there's giant concrete blocks in the way. So instead you have to go back out to the super busy 95 and make two left turns. I think I found what you're talking about. That was always a pet peeve of mine: properties with adjoining pavement that's then arbitrarily blocked off. I can think of an apartment complex in Reynoldsburg that did a similar thing. If you don't want to bother with all that, the best you can do is Jersey City, NJ via I-78. Though at least you can take PATH from there and leave your car. * Maryland bridge toll: this one's sorta complicated to avoid, and involves going south to US-40's bridge instead or (if that one has a toll) going north all the way to Conowingo Rd (US-1). * Delaware toll at exit 1: this one's ridiculously easy to avoid. Just take exit 1 or 109 and use Otts Chapel Road and Elkton Road to bypass the toll booth. * New Jersey Turnpike: to avoid this one, follow "real I-95" and go through Pennsylvania instead of New Jersey. I haven't charted the full course for this toll skip yet though. I'm pretty sure it involves some non-expressway roads. * George Washington Bridge / NYC: This one's also very complicated. You can either go around NYC completely, and then approach NYC from the Bronx or Connecticut side, or I think there may be like one or two non-expressway bridges that are non-toll. Yeah, the hard part is all the bridges over the Hudson. Oh, and I-87 north of town is tolled. If I feed it to the Google and tell it to avoid tolls, it goes I-270>US 15>I-81>I-78 and then says "screw it" and sends you over the Holland Tunnel. The more circuitous route would take you hundreds of miles out of your way. It's pretty much a non-starter unless you already live close to the Taconic State Parkway. If you're in Jersey or Long Island, you're still screwed. I just stumbled on this gem on my hard drive. Pretty sure this was on Broad St heading east. This sign is no longer in service. There's a road in Arizona named Devil Dog Road. It's got an exit on I-40, a bit west of Williams I think. 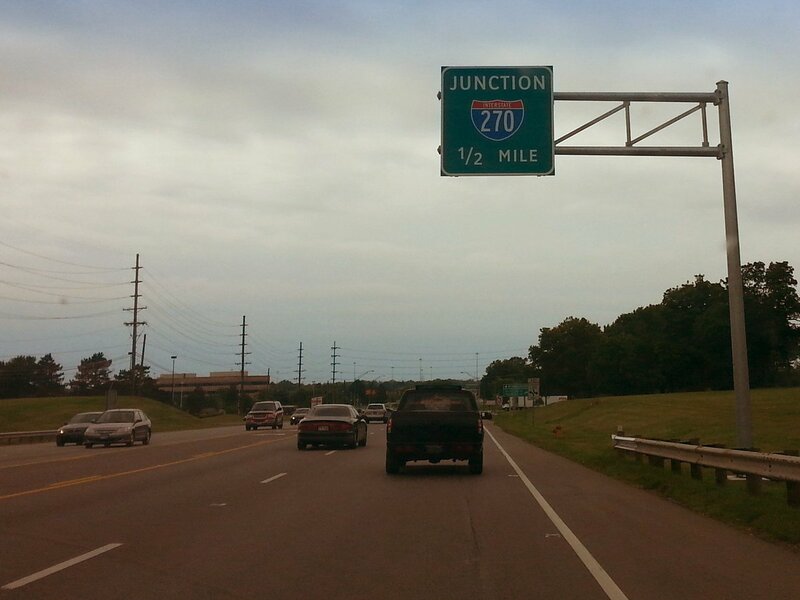 @vtk: So as far as I can tell, there are three major generations of I-270 signage as far as control cities go. I still haven't figured out why they dropped city names entirely, but there it is. Yeah, that's it as far as I know. Speaking of no control cities, here's an example from Virginia (who are usually pretty good about them). @lee4hmz Here's a quick before-and-after from OH 16 / E. Broad Street. The signage with no city names just looks weird to me. 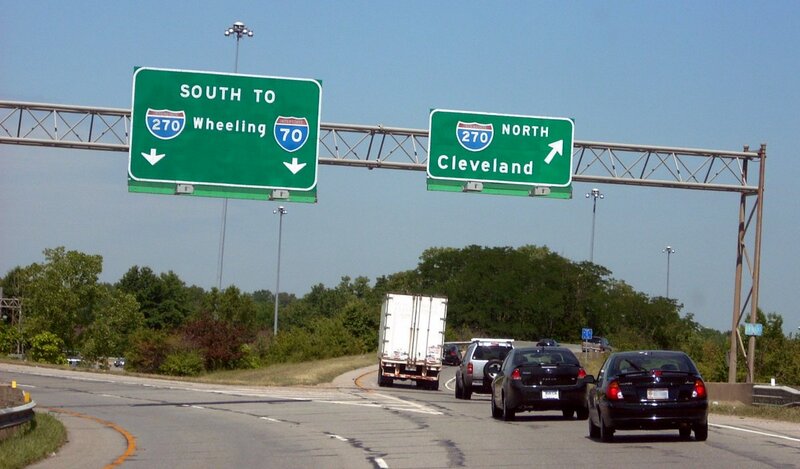 That sign for 270 south had some serious layout problems anyway. Yeah it was pretty bad. Generic round shield for OH 161. This is on US 23 northbound in Worthington. Times New Roman street name sign (ugh). I don't think that's how this works. 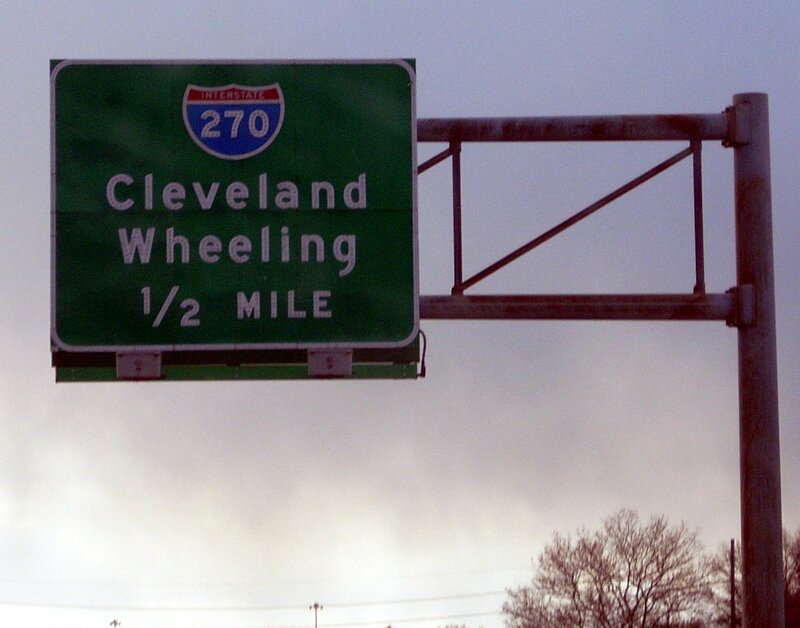 I don't think this sign is there anymore, but I was amused with the blank space left when "A-B" was removed from "EXIT 26 A-B" after the I-71 interchange was rebuilt. I'm not sure this is right, either? But at least it kinda makes sense because you might otherwise expect a grade-separated interchange instead of an at-grade crossroads. Why is the JCT 53 sign not right? I figured (correctly) you were on a different road. Is the intersection actually a three-way intersection, though? No, it's a four-way intersection. Here's the sign in context. You can judge for yourself whether the meaning would be clear to you, I guess. I think its meaning is clear, aside from suggesting a 3-way intersection. 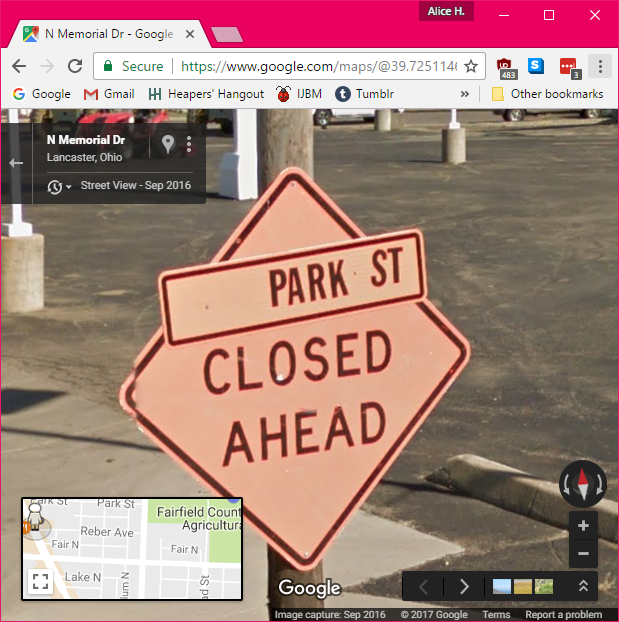 Courtesy of Google Street View: Two different ways to make a white shield stand out on a white sign background. I prefer the one on the left, though @Ikaheishi has suggested the one on the right might look better with a thicker outline. The US 40 badge on the right needs a thicker outline, definitely. On the left, "USE TOWN ST EXIT" isn't properly spaced out to be fully clear. Things I need to get a picture of: the "TO I-70" assembly on the way out of Eastland Mall that has an Interstate shield on a white square with series C numerals. It seems like some agencies (and/or their contractors) treat all signs with ROAD CLOSED interchangeably. Like this 2012 New Albany, Ohio closure. This point was impassable; US 62 at this intersection was very much not open to "local traffic". I've also seen the reverse, with straight-up ROAD CLOSED being used when they clearly intend drivers to be able to access properties that fall between the intersection and the point of closure. I've seen the latter and other incorrect signage put up by contractors way too many times here in California. So much that I can't even think of a specific example off the top of my head, even though I vaguely recall seeing such just a few weeks ago. 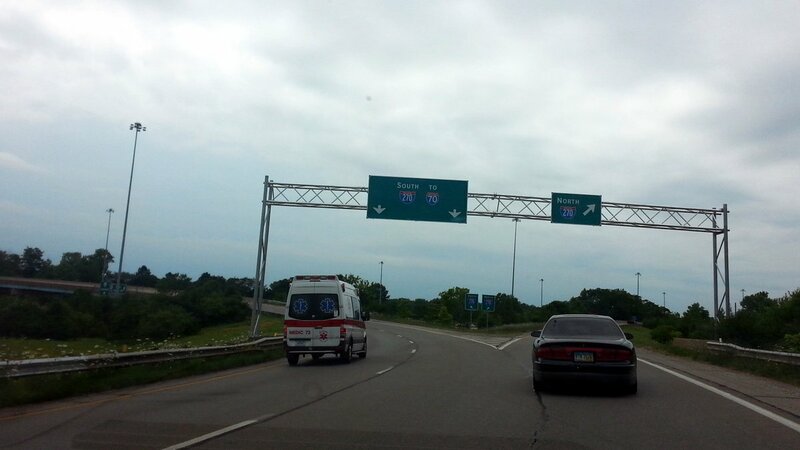 It's not on Street View yet, but...the overhead sign at the US-33/OH-161/OH-257 roundabout in Dublin. Good gravy. Way too much information packed onto the sign to be able to get it all at a glance as you drive past.